Motorcycle racing gets the adrenaline pumping, whether you’re sitting in the stands watching or in the saddle measuring up to the other competitors. Everyone is facing varying degrees of stress and emotions and understandably, tempers can flare. We’ve recently seen one of the most “extreme” cases of tantrums back in September 2018, when Moto2 Romano Fenati pulled the brake lever of competitor Stefano Manzi in a fit of anger. The repercussions of Fenati’s gesture were tremendous and the rider downgraded to Moto3 in the hopes of laying low for a while. Two Costa Rican racers one-upped him and took things to a whole new level—a helmet-punching level. The event happened in February, during the Costa Rica national motorbike championship, between Jorge Martinez and Marion Calvo. 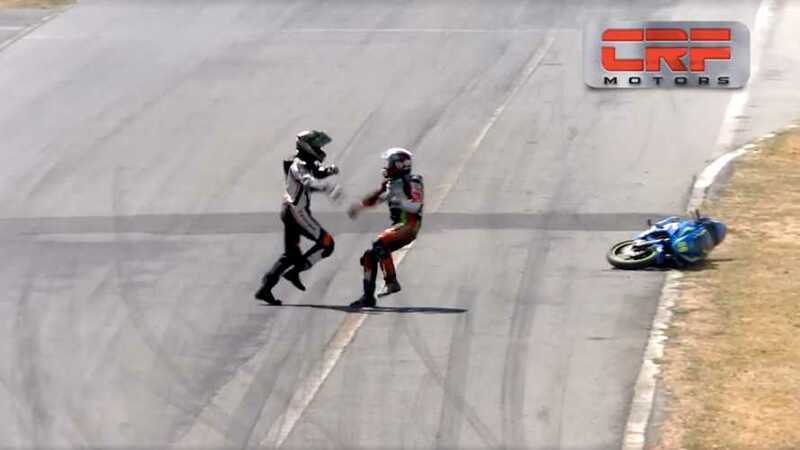 Like it sometimes happens in motorcycle racing, one of the two riders (Calvo) seemingly came in contact with his opponent Martinez as he was passing him on the right, making Martinez lose control of his bike. As the motorcycle went its separate way, Martinez is left to hold on to Calvo’s pillion as he slows down following the impact. As they come to a halt, Martinez could have jumped off his opponent’s bike to try and get back in the saddle as quickly as possible, but Calvo’s mistake obviously angered him. So he punched him in the money-maker—by that, I mean the helmet—sending Calvo tumbling off his bike. Calvo doesn’t waste time getting back up to chase after Martinez and give him a shove. The angry racer walks away, crossing the track in the middle of his oncoming opponents to rejoin his bike while Calvo picks up his own and tries to get it started up again. Obviously, both racers were kicked out of the race and the case was decided by the Latin American Motorcycle Association who recently decided to ban the two hotheads. If there’s a useless punch it’s definitely one in a motorcycle helmet. On the bright side, neither of them got hurt, aside from a few bruises on their respective ego. I’m also glad to see poor sportsmanship so strictly regulated.